Anti-government protesters prepare to advance over a burning barricade in Kiev's Independence Square, Feb. 20, 2014. 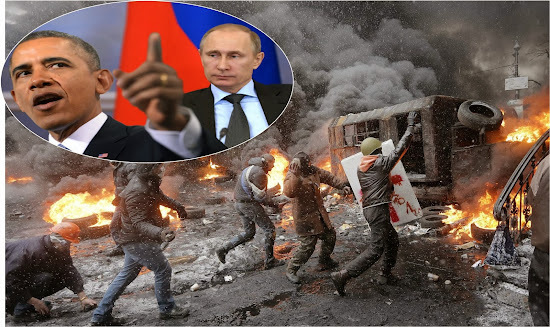 A war of words between President Obama and Russian President Vladimir Putin over the violence exploding on the streets of Kiev, Ukraine, this week shows the global tug-of-war between East and West erupting in the former member of the old Soviet Union. The tensions between protesters and government security forces became deadly overnight in Independence Square, where Ukrainians have gathered for months to protest President Viktor Yanukovich's decision to back out of a deal with the European Union and instead join an economic group led by Russia. Protesters felt the EU deal would have been a significant step forward in building relationships with Western nations, but that Yanukovich was pressured by Putin to spurn the West and continue its close relationship with Russia. Statements by Obama and Putin this week show how each country is trying to blame the other for meddling in Ukraine. "I think this is an expression of the hopes and aspirations of people inside of Syria and people inside of the Ukraine who recognize that basic freedoms – freedom of speech, freedom of assembly, fair and free elections – are fundamental rights that everybody wants to enjoy," Obama said Wednesday while at a summit in Mexico. "Mr. Putin has a different view on many of those issues and I don't think that there's any secret on that." "Our approach in the United States is not to see these as some cold war chessboard in which we're in competition with Russia. Our goal is to make sure that the people of Ukraine are able to make decisions for themselves about their future." "The United States will work with our European allies to hold those responsible for violence accountable and to help the Ukrainian people get a unified and independent Ukraine back on the path to a better future." "We cannot characterize what is happening in Ukraine as anything except a violent attempt to seize power," Foreign Minister Sergei Lavrov said. "Many Western countries, who have tried to interfere in events and played games with insurgents, are also to blame. The West has solidly, repeatedly and shamefully avoided criticism of the actions of extremists, including Nazi elements." "We condemn acts of violence and repression from those in power and our first call is that it stops. But those who have committed such acts and are preparing to do so again need to know they will be punished," said French President Francois Hollande. "Only political dialogue can bring real progress. By saying political dialogue I mean a transition government, free elections. And whatever Germany, France and the EU can do, we will do," German Chancellor Angela Merkel said.